Version 3.0 of “ShotList”, our app for planning out your movie shoots scene by scene, arrives on the App Store today with a number of new features requested by our users- including easier navigation from strip to strip in your project, and a great new way to find all your scenes that match a particular criteria. You can now move directly between strips from the Details page by swiping up or down with one finger, this moves to the previous or next strip in your current shooting order. You can now edit or view notes by tapping them, just like the other panels on the Details page. On the Notes page you can scroll forward and back with a swipe, or tap to activate hot links for phone numbers or web addresses. To edit notes, tap the button at top right. When you return to the Stripboard page from the Details page, the strip you were editing will flash briefly in blue to help you locate it. Show Notes In Oneline Schedule. You can now output notes with the oneline schedule if you wish. Simply enable the slider for “Include notes”, and any notes that exist for a strip will be added to the schedule output. We also fixed a bug where the total number of pages wasn’t displayed correctly for each day. 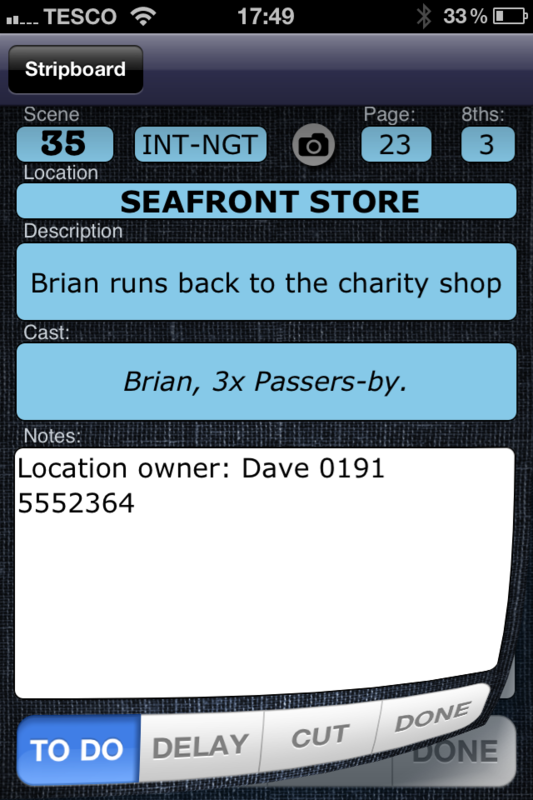 Filtering Scenes By Character, Location Or Time Of Day. This will select all strips that match a chosen set of conditions. You can select combinations of characters, location, time of day or setting (interior, exterior, I/E or greenscreen). All strips that match are selected- ready to move or duplicate, or simply to review. This allows you, for instance, to easily find “All scenes that involve your lead actor at night”, “All scenes with your star and co-star together” or bring up “All daytime scenes at the BEACH or BEACHHOUSE locations”. Version 2.0 has just been released on the App Store, and is the first of what we hope to be a string of updates to ShotList. Over time we plan to build this app up into an indispensable tool for filmmakers of all abilities. We do this by listening to our users and adding the features that are most often requested via our support email address or App Store or Blog reviews. Almost all of the features added in this update are a direct result of a request from one or more users, and address over half of the items raised in our App Store reviews. This update adds a number of major features and fixes. We will incorporate them into the User Guide for new users very soon. NEW: Select and move multiple strips on the Stripboard. This lets you move groups of strips around on the stripboard much more easily. You can select strips from all over the stripboard, and they are all grouped together when they move, so this is a good way of, say, gathering all the shots for a specific location together, or moving all the shots for a shooting day to a new place in the schedule if the order changes. To select several strips at once tap the middle of a strip, they light up as they are selected. Tap a strip again to deselect it. The navbar shows how many strips you have selected. Deselect all the strips or tap “Done” if you wish to leave this mode. To move selected strips tap “=” on a selected strip. You can now drag it to the position you want to move the strips to. They will form a new group there. NEW: Duplicate strips, singly and in groups. A few users asked to be able to duplicate strips instead of just creating new, blank ones. This lets them do that for individual scenes, and also to copy a full run of scenes if they have a sequence repeated by different actors, or in different locations. To duplicate strips, select the single strip or group that you want to duplicate (as shown above) then tap “+” on a selected strip. This creates duplicates of the selected strips. The duplicated strips remain selected so you can move them to a new location easily. The scene numbers have the letter “D” added, to show that they are duplicates. NOTE: You can copy Day Markers right along with those scene strips if you want, they behave consistently. 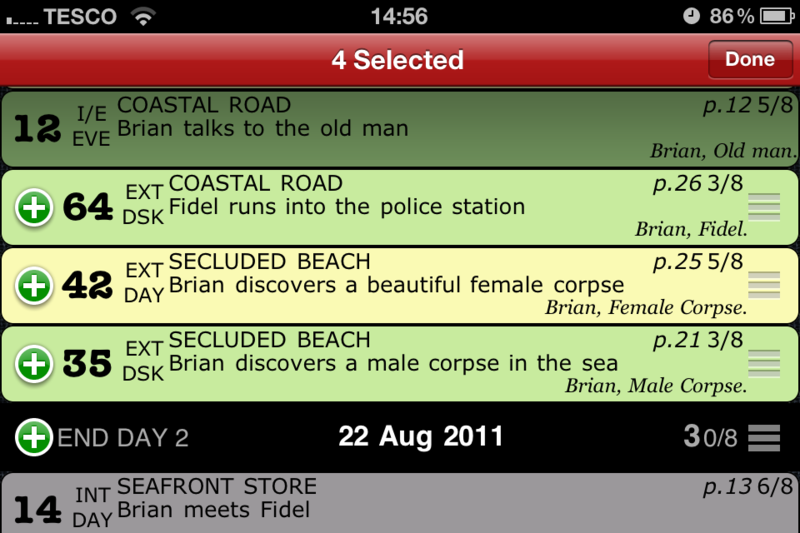 You can now view all six of your storyboard frames for a scene as thumbnails right on the iPad Details screen. Tap an image to toggle it as complete when it has been shot. On all versions a new camera icon added to the Details screen provides quick access to the Storyboard screen for that scene. It works like the camera icons on the Stripboard screen, showing whether all the shots are complete. NEW: Show cast as names rather than numbers. By default, character names instead of numbers are now displayed on the Stripboard and Details screens. If you would like to change this, switches in the Settings app provide separate control of which is displayed on each of those screens. Renaming and reordering the cast is planned for a future update. NEW: Added options to for location type and time of day settings for each scene. In addition to INT and EXT, you can now also choose” I/E” (INT/EXT) and “GRN” (for a greenscreen stage). I/E will use the same strip colours as EXT, and GRN uses a bright green for all times of day. 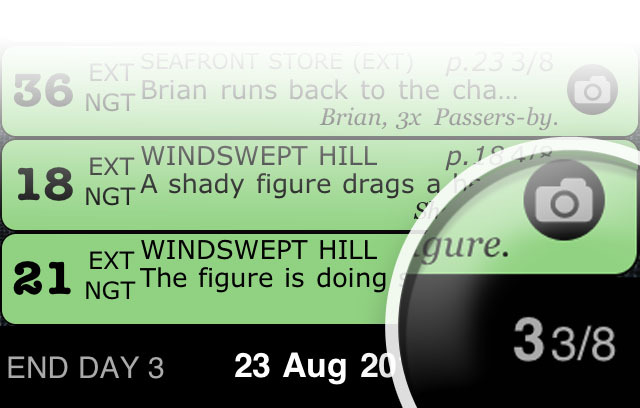 You can now choose “MRN” and “EVE” for times of day for each scene, in addition to DWN,DAY,DSK and NGT. 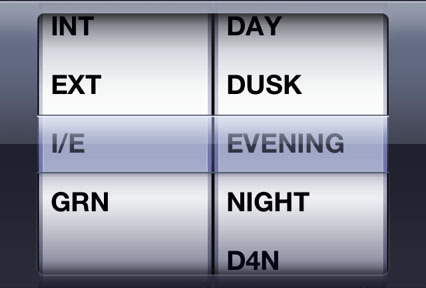 There is also a new option of “D4N” for “Day For Night” shooting. NEW: Page Count shown on day strip as “days and eighths”. A minor tweak, but when showing the total number of pages planned for each day’s shoot we now show the number of pages and eighths, (e.g. “3 4/8ths”) on the day strips, instead of large numbers of eighths (such as “28/8ths)”. Increases compatibility with iPad. We will be looking at making more use of iPad-specific features in future updates. FIX: iPad Photo Library crash. There was a problem when adding images from the Photo Library, only on iPad. This is now fixed. FIX: Enter Dropbox with no project selected. You can now enter the Dropbox section, even with no projects on your device. FIX: Load more image formats from Photo Library. Some image sizes in certain formats wouldn’t load from the Photo Library correctly, they now will. FIX: Replace the tide table link in new Sample Projects with a real one. Very minor tweak, but the sample project created for new users contains an example of an internet link. This now goes to a real site rather than a dummy, as otherwise users may think the feature doesn’t work. We hope you enjoy the new features. If you would like to see something added or changed, please let us know. We can’t promise we will be able to do it in the next update, but it helps us to prioritise our work, and to get a clear image of how you are all using ShotList, and to tailor it to your needs. The next update is planned for around 4-5 weeks time. If you are finding ShotList useful (and especially if you see a criticism in an earlier review that has now been addressed) we would love you to review and rate ShotList on the App Store. The more people are using it, the more we can continue to support and expand it into the fantastic tool I am sure we would all like it to become. 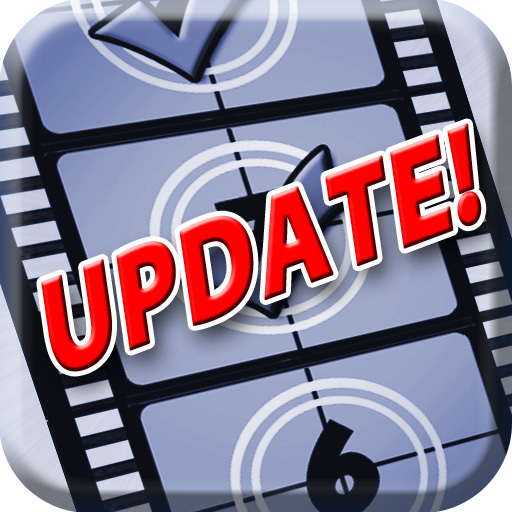 Please send requests, or comments to shotlist@solubleapps.com.